Manila, Philippines– As city dwellers, we burden a sequence of challenges brought by our fast paced lives. Long holiday breaks are just around the corner but there will be times that you’d rather stay home than spend most of your time in airports or queuing in bus terminals. 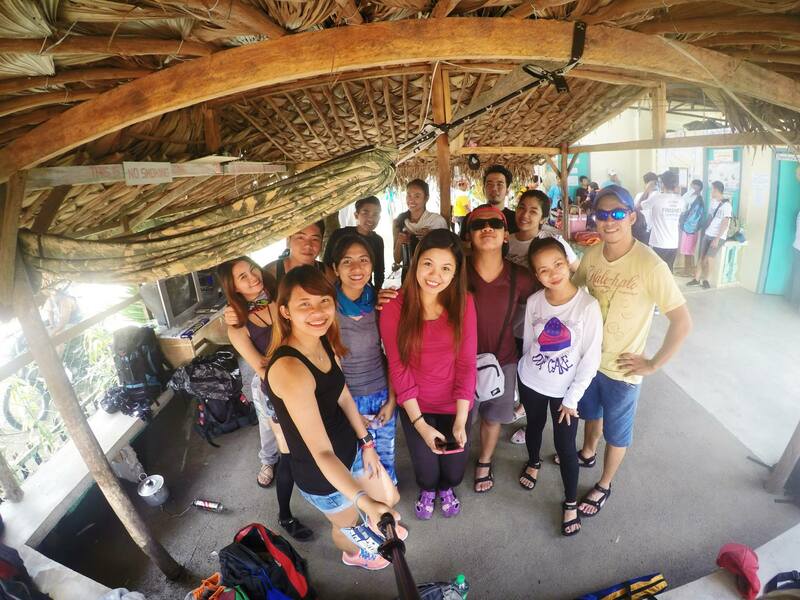 Getting lost for awhile seem to be so impossible, until my college friends arranged a trip in nearby Rizal province. Locked by two provinces, a hidden world promise a soothing break from the so called, city life. Rising 739 meters above sea level or 2,524 feet, Mt. Daraitan slice through the border of Tanay, Rizal and General Nakar in Quezon. 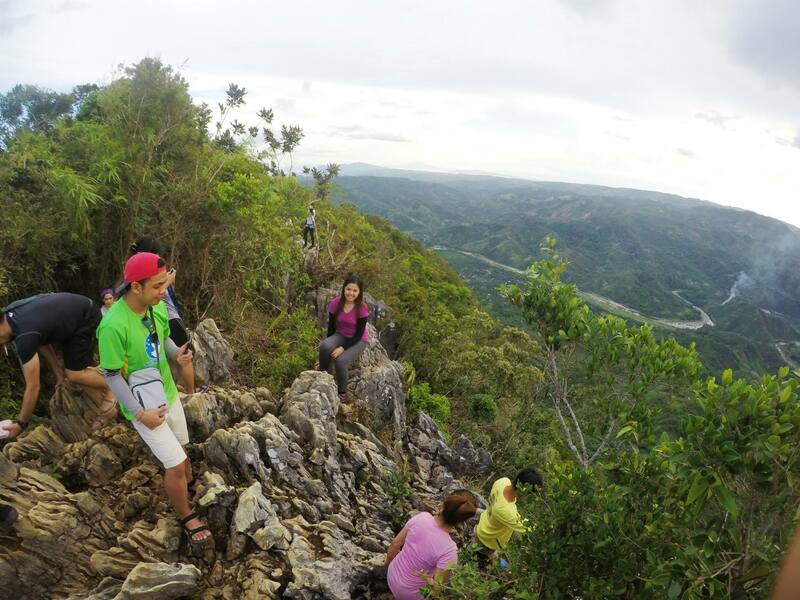 From the summit, hikers can appreciate an unobstructed breath-taking view of Sierra Madre mountain range and nearby province. The mountain is classified under minor climb with 4/9 difficulty category, and it features a tropical forest with mostly assault trail. Below Mt. 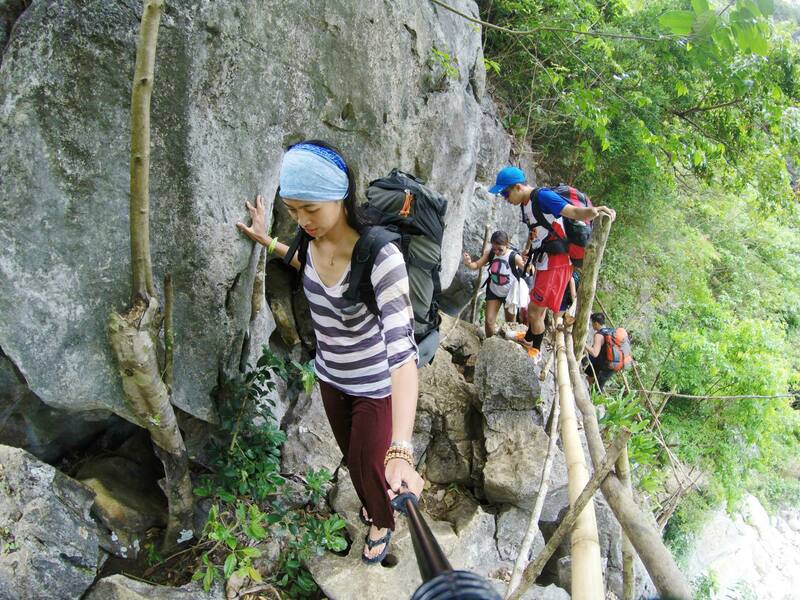 Daraitan, Tinipak river on the other hand is the best side-trip for your hike with its cold and clear water stream. 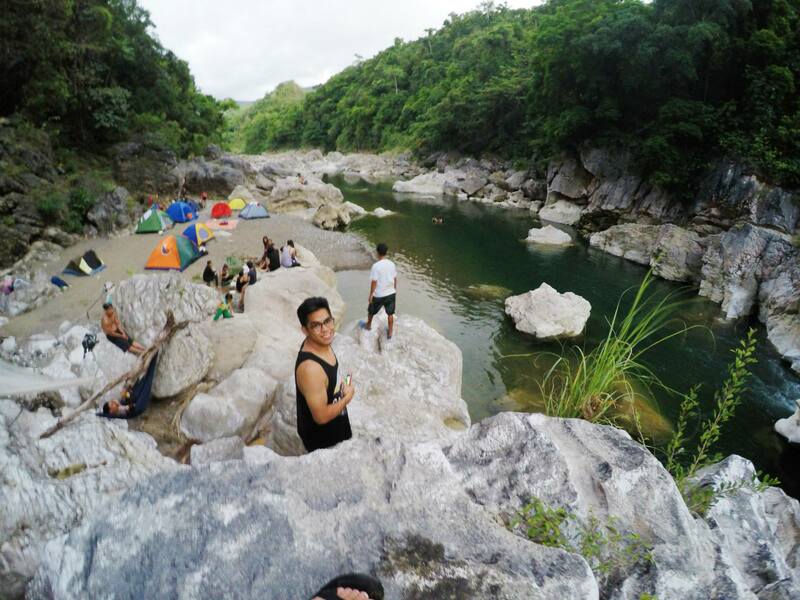 Acclaimed as the cleanest inland body of water in Region IV in 2013, Tinipak river is an ideal spot for washing off heat before or after your hike. A number of fresh water springs are available in the area, so potable water for cooking and drinking will not be an issue during your stay. Both destinations are frequently visited due to its proximity in Manila. The ‘Instagrammable’ scenery at the riverside trail of Tinipak. Our journey to ‘Jumanji’ began at 8 in the morning from the transport terminal in Star Mall, Mandaluyong. In a three hour comfortable drive, our hired UV Express van (a type of public utility transport service in the Philippines) took us to downtown Tanay in Rizal. We then transferred to another hired vehicle, the jeepney, that brought us to the jump-off point–Barangay Daraitan. Total travel time is between 3 to 4 hours, depending on the morning traffic in the city. We went there as a group of 14 people, while most of them are my friends from college the other guests of the climb easily become my new buddies. And this is what I love in hiking, meeting new adventurous people. #DaraitanMenTeam at the Barangay Hall. Photo by Greisha Padilla. At the Barangay Hall or the village center, some of my friends pre-cooked our meals with their portable cook sets and wares while the others prepare for our an hour and a half trail to the camp site in Tinipak river. As usual, we logged in the guest book and met our friendly and trained local guides. It was a hot summer high noon when we began our trek and its highly recommended that you wear arm sleeves and appropriate pants to protect you from roasting your skin, applying sunscreen is also ideal as well as wearing comfortable sandals or trek shoes. 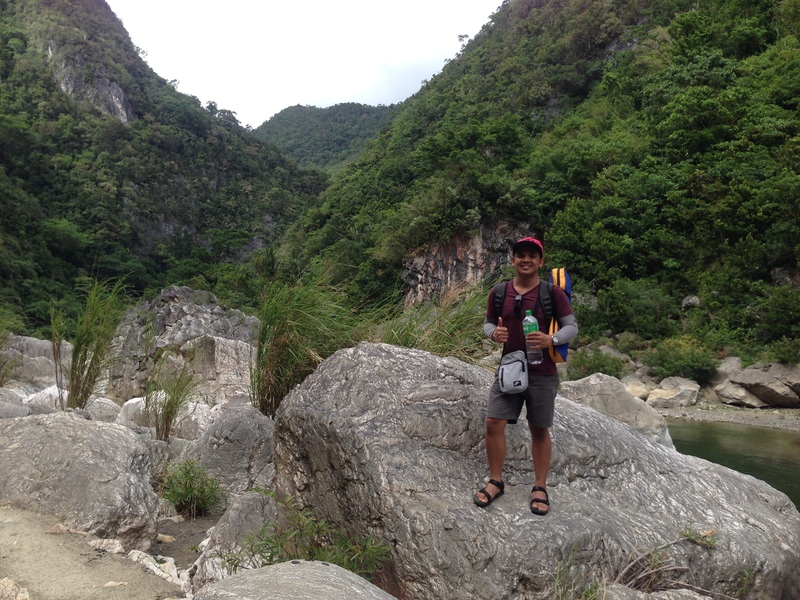 It didn’t took a while before we were welcomed by limestone boulders back dropped by cascading mountains of Daraitan. The forest of tropical trees and vines get thicker as we go further, covering most of the scenery. Part of the river system is surrounded by high cliffs enclosing the stream with its rich vegetation that gave us a sense of entering a lost world. The campsite is only 15-20 minutes away from this exciting point of the trail. Photo by Greisha Padilla. The trail is a variety of muddy, grassland and a touch of easy to medium rock climbing thrills. And the relaxing sound of the water that cuts through the river and our loud laughs filled the area that afternoon while we’re enjoying the scenery. There are small stores along the way that sells refreshing bottled water, sodas or the all time bundok favorite– Halo-Halo to cool your body from the heat. Freshly cooked Banana-cues and other Saba banana by-products are also available in case you’re running low in sugar or just unhappy with your trail snacks. Our campsite at the far end and less ‘challenging’ to swim part of the river. Yes, most of us can’t swim. Photo by Greisha Padilla. Camp sites are scattered on the river banks, so it’ll be on your discretion or space availability where you will pitch your tents. Ours were located on the most allowable end, on the less ‘challenging’ shallow water side of the river. 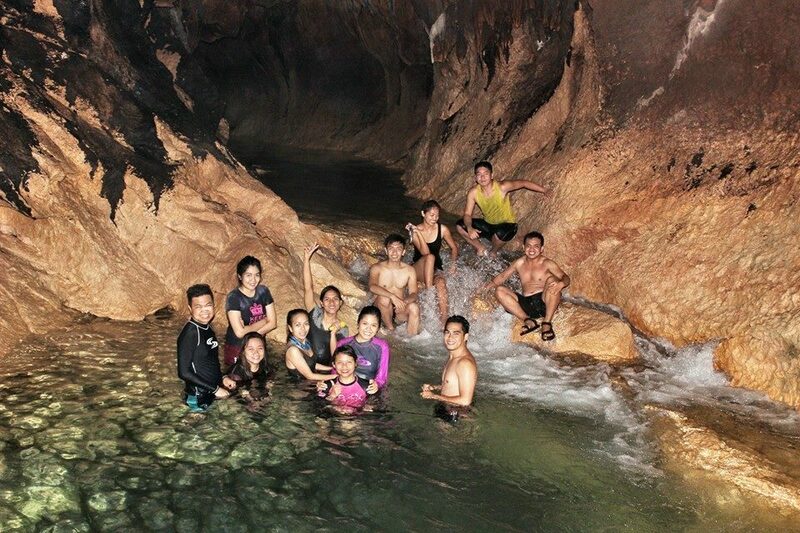 After dinner, we went to the nearby Tinipak Cave, where I believe one of the highlights of this trip. Trekking from our camp site wasn’t that easy, given that we need to slide and hop on the wet limestone boulders to get on the other side of the river…with bare lights from our headlamps. It took us almost half an hour to reach the opening of the cave where our guides assist our steep descend inside. Little that I or probably all of us know, we are in for a surprise that night. After our short walk towards the chamber of the cave, a river system inside brought our adrenaline high with its clear and rushing waters. Still hesitant (I can’t swim), we asked our guide to do the first plunge. The rest is history of ultimate fun, our kind of evening bath. Our kind of refreshing underground bath at 8 in the evening. Photo by Agatha Ruadap. We did had a great time in Tinipak, where we cherished “nature’s bounty and beauty,” thanks Agatha! The next day, we break camp at 7 in the morning and began trekking back to the Barangay hall, there we left our bags locked in one of the offices for us to conveniently assault the summit. While most of us are busy looking for power outlets for our drained iDevices, Gonz, Jesy and Victor prepared our lunch that day. We had Gonz’s Sinigang, a sour Filipino soup with chopped pork and tropical veggies. A soothing dish while enjoying each others’ company. At the summit of Mt. Daraitan. Loaded with carbs that we needed, we were then oriented by our guides and geared ourselves with sun protections, headlamps and bottled water. I suggest that each person bring 2 litres of water for their personal consumption. In case you missed bringing the mentioned gears, it can be rented at Php 50 or a dollar per gear per person. Accustomed to Filipino christian faith and our tradition as hikers, we had a group prayer before our climb. Philippine sunset view at the summit of Mt. Daraitan. On our phase, our ascend to the summit took roughly two and a half hours. The trail is characterised with thick tropical forest where our eyes feast with its commanding view of Rizal and Quezon province. A notable part of the trail was the ‘mysterious’ underground holes where cold air blows and cools our feet. We suspect that there are pressurised cave chambers under that cause the air to escape the vents. From there, the summit is only 30 minutes away. For guests’ convenience, the local government put up plenty handrails for everyone’s safety. 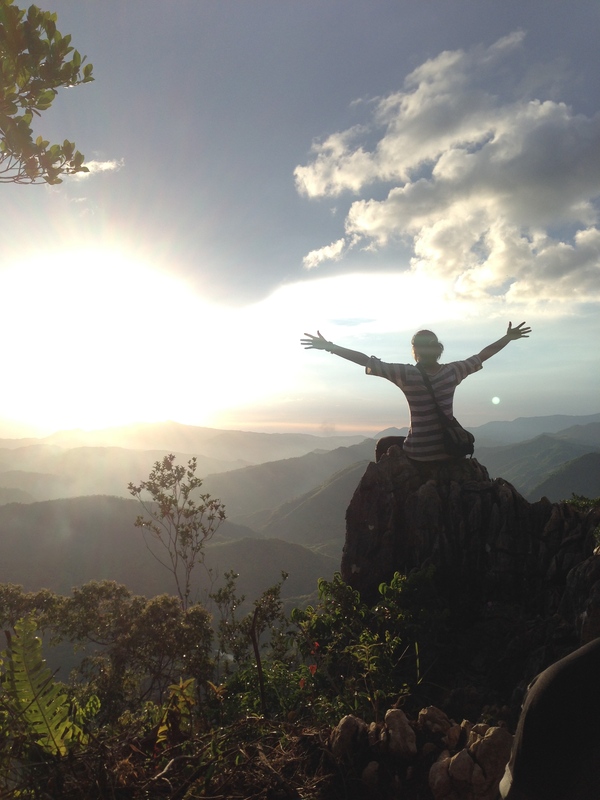 Philippine sun is already setting when we arrived at the summit, with the cold mountain breeze, I sat down for a moment and grasp the scenery above before rejoining the group for photo ops. Mt. Daraitan and Tinipak River is truly a package to take from nature that eases worries and stress. For a complete stress-free guide to Mt. Daraitan and Tinipak river, email me at gilgacumajr@live.com. 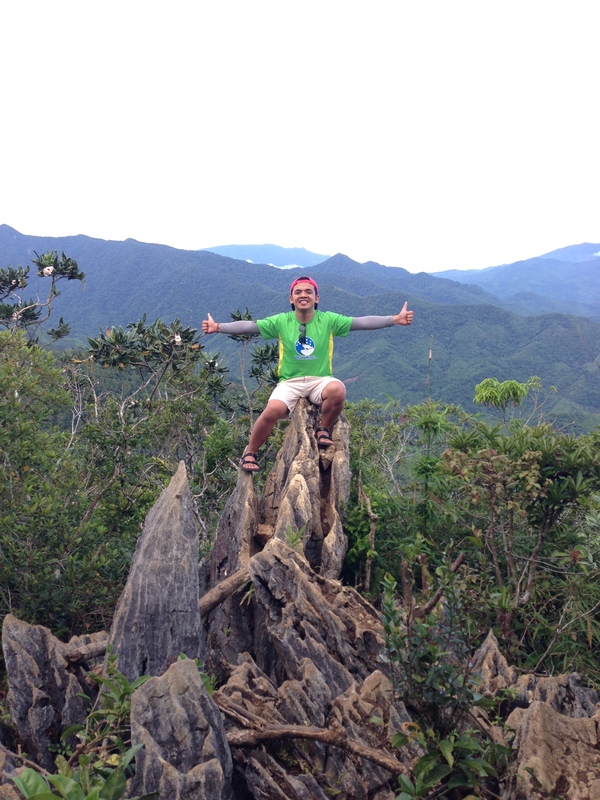 Commanding view of Tinipak river and Rizal province from the summit of Mt. Daraitan. Photo by Greisha Padilla. yes!!! been here last summer with my two colleagues. its been a great experience especially when you do it for an overnight stay.